Small volumes of anti-PRODH antibody vial(s) may occasionally become entrapped in the seal of the product vial during shipment and storage. If necessary, briefly centrifuge the vial on a tabletop centrifuge to dislodge any liquid in the container`s cap. Certain products may require to ship with dry ice and additional dry ice fee may apply. 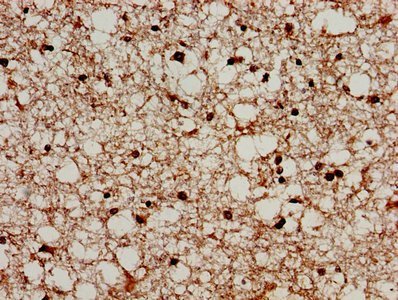 IHC image of MBS7048939 diluted at 1:300 and staining in paraffin-embedded human brain tissue performed on a Leica BondTM system. After dewaxing and hydration, antigen retrieval was mediated by high pressure in a citrate buffer (pH 6.0). Section was blocked with 10% normal goat serum 30min at RT. Then primary antibody (1% BSA) was incubated at 4 degree C overnight. The primary is detected by a biotinylated secondary antibody and visualized using an HRP conjugated SP system. 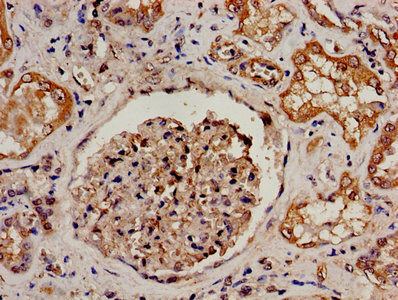 IHC image of MBS7048939 diluted at 1:300 and staining in paraffin-embedded human kidney tissue performed on a Leica BondTM system. After dewaxing and hydration, antigen retrieval was mediated by high pressure in a citrate buffer (pH 6.0). Section was blocked with 10% normal goat serum 30min at RT. Then primary antibody (1% BSA) was incubated at 4 degree C overnight. The primary is detected by a biotinylated secondary antibody and visualized using an HRP conjugated SP system. PRODH: Converts proline to delta-1-pyrroline-5-carboxylate. Defects in PRODH are the cause of hyperprolinemia type 1 (HP-1). HP-1 is a disorder characterized by elevated serum proline levels. May be involved in the psychiatric and behavioral phenotypes associated with the 22q11 velocardiofacial and DiGeorge syndrome. Defects in PRODH are associated with susceptibility to schizophrenia type 4 (SCZD4). A complex, multifactorial psychotic disorder or group of disorders characterized by disturbances in the form and content of thought (e.g. delusions, hallucinations), in mood (e.g. inappropriate affect), in sense of self and relationship to the external world (e.g. loss of ego boundaries, withdrawal), and in behavior (e.g bizarre or apparently purposeless behavior). Although it affects emotions, it is distinguished from mood disorders in which such disturbances are primary. Similarly, there may be mild impairment of cognitive function, and it is distinguished from the dementias in which disturbed cognitive function is considered primary. Some patients manifest schizophrenic as well as bipolar disorder symptoms and are often given the diagnosis of schizoaffective disorder. Belongs to the proline oxidase family. 3 isoforms of the human protein are produced by alternative splicing. 1. the frequency of a recurrent small 22q11.2 deletion encompassing PRODH and the neighboring DGCR6 gene in three case-control studies, was studied.